Well hello everyone, Darcy here with a new topic to get your teeth into, by far the most colourful topic! This is kind of an unusual Topic Challenge, as we are very focussed on Seth's New paints (we know how much you love a new paint colour). 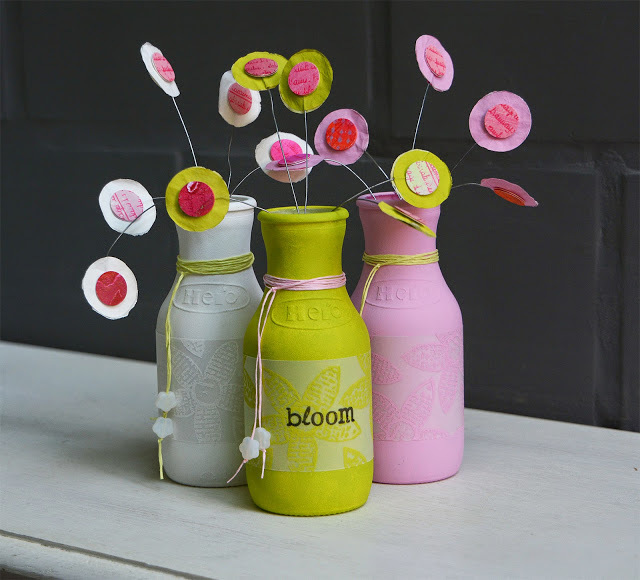 Obviously they are so very, very new, these babies are still filtering through to the PaperArtsy Stockists as we speak! However, you may have in your stash some of these, as the picture below shows you all of Seth's 16 paints together...either way, whether you have old or new, these 16 paints are fun to play with! 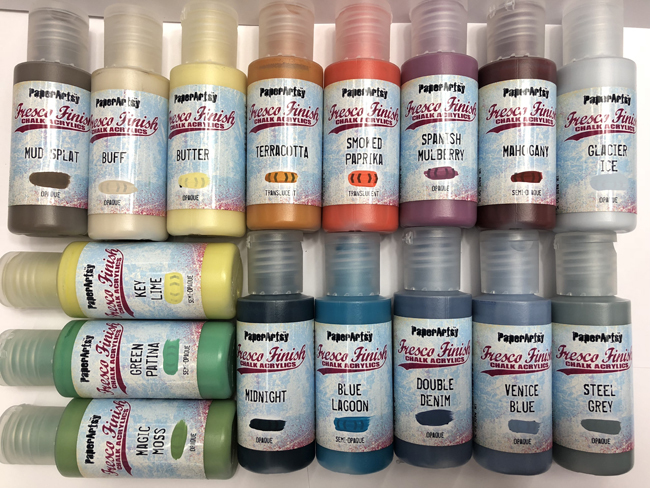 So, if you have not laid your crafty paws onto Seth's newest offering, then the topic challenge will still allow you to share your painterly adventures with all our Fresco Chalk Acrylic Paints. We do have rather a lot of colours on offer in addition to the limited editions (which now number 24 paints) there are another 96 on the racks! That's 120 in total! Naturally, we are happy to see you using other brands too if you wish. 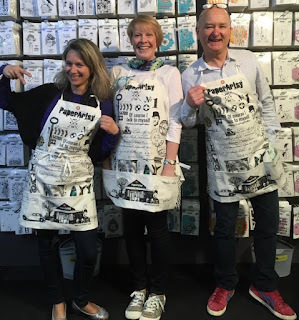 It's all about having some fun and getting your paint apron on! In the meantime, let's take a look at some past and present Fresco magic. 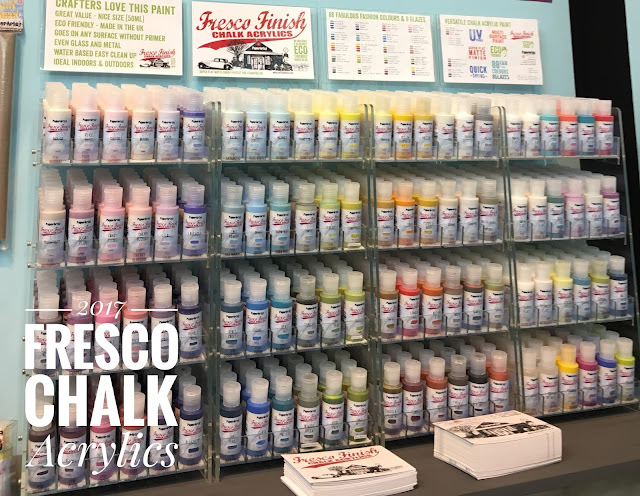 The beauty of Fresco paint is just how versatile it is in terms of how well it works on all kinds of substrates, from paper to card, to glass, metal, wood and fabric. 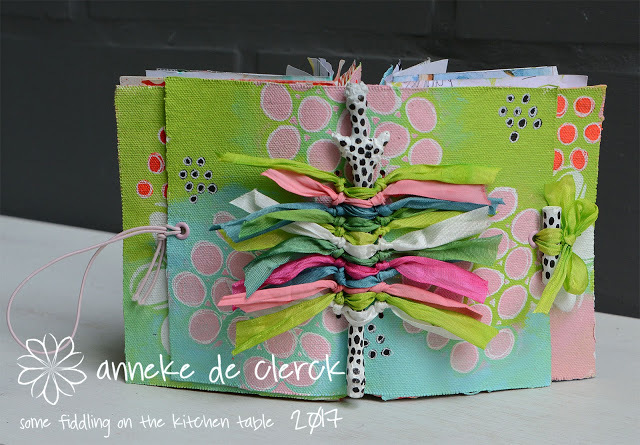 Anneke de Clerk shows us a perfect example here as she paints on fabric to create this fabulous pocket journal. 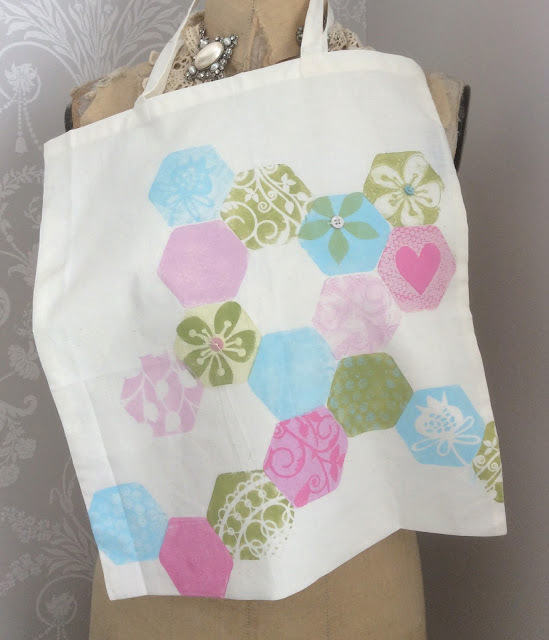 Jo Firth Young has also played with fabric to create this gorgeous gelli printed bag. and here Lauren Hatwell takes painting and stencilling to another level with this gorgeous cushion. Frescos also work on wood, here Jo Firth Young has a gorgeous wooden frame, decorating simply, but the combination of beautiful colours and matte finish means this turns out looking professional. Above, on the frame, do you see the hint of a shadow?, this was done with a coloured pencil, but there is an amazing technique for creating shadows that when you see it you will want to try immediately. It is called the stencil bump, and here is Leandra to show you how. 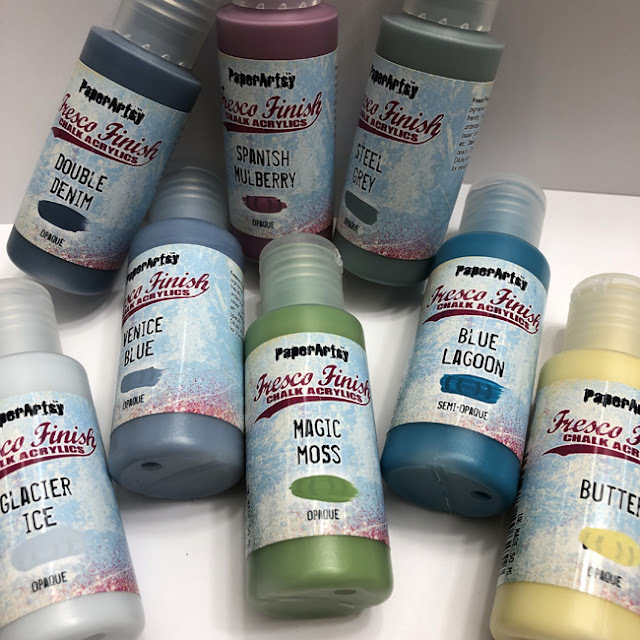 Of course Fresco finish paint is just as at home on paper and cards, especially our Smoothy card, as the colours are fresh and beautifully matte they work brilliantly for the minimal, clean look that Keren Baker is known for. 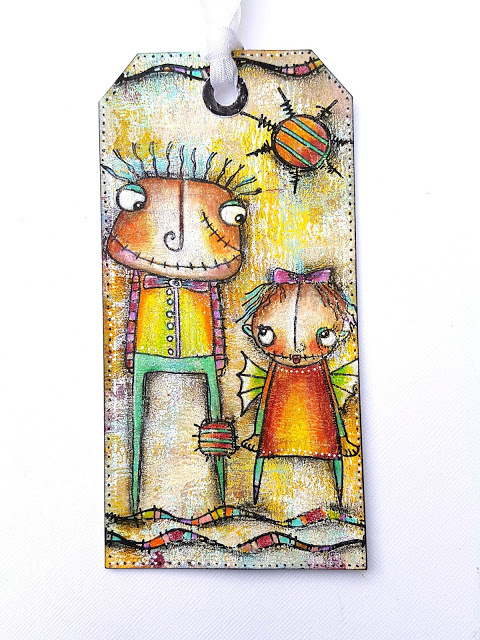 and it is perfect for Zinski characters, here Christine Dark has created a gorgeous brayered background, leaving lots of texture to give these characters extra personality. Another project by Anneke de Clerck showing how Frescos work fabulously on glass bottles, the coverage is perfect and the matte finish is so classy. Fresco finish paints are compatible with so many techniques but also with other products. Here Ellie Knol combines them with Infusions. Next up a video from Leandra, showing Fresco paints with crackle glaze, over grunge paste and topped off with a touch of Treasure Gold, a real mash of products that all work in harmony. Here Gabrielle Price shows us the perfect marriage of grunge paste with fresco, texture and colour.. ahh be still my beating heart! 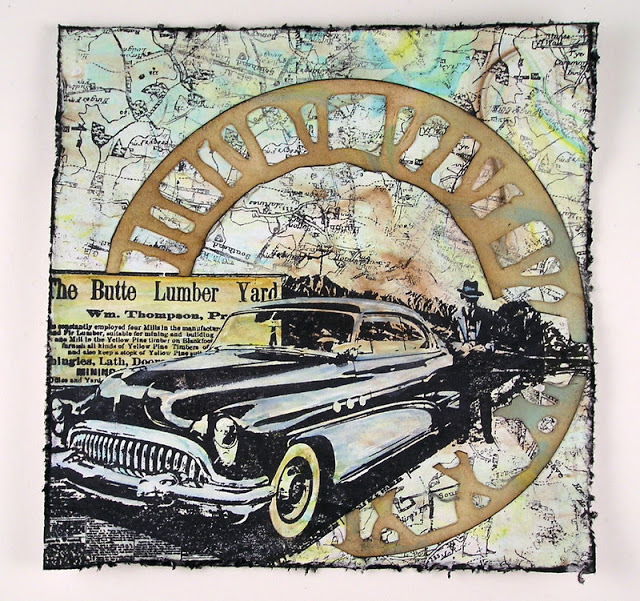 We are often asked to show customers how to create a background, and by far one of the easiest ways is with a brayer. Watch this video from Leandra as she shows how to create a painted background, also sometimes called a master board. Following on here we have Emma Godfrey showing all the steps from creating her masterboard right through to how she then uses the background to create cards. If brayering isn't your thing then Leandra has another video, this time showing her corner,corner side technique to ensure even distribution of colour. 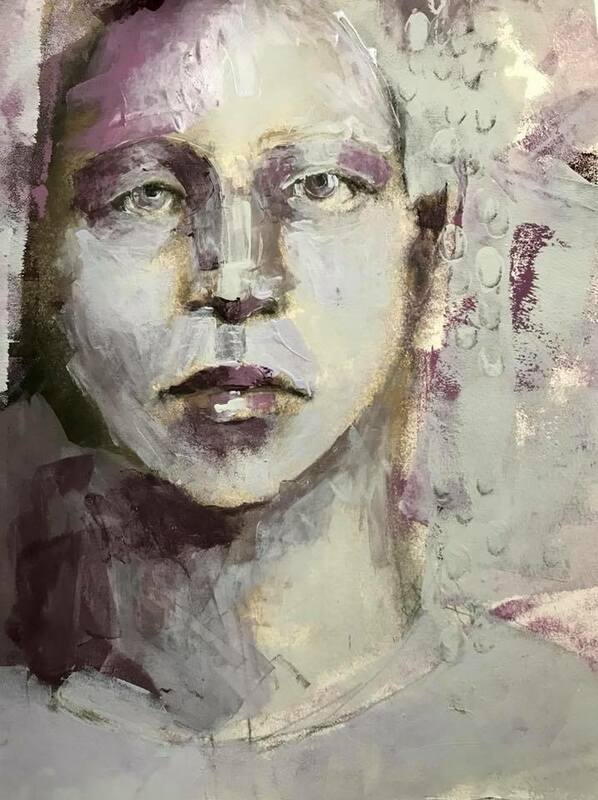 Another great technique is the transference of paint, this can be done by painting onto card and transferring this to another piece of card., known as mono printing. Seth After uses this technique a lot, here he is demoing from last year. Many people wonder if PaperArtsy Fresco finish paints can be used on gelli plates, the answer is yes, of course, with gorgeous results. Here we have a wonderful creation of layers resulting in this fab elephant. Follow the link through to see all the printing steps. 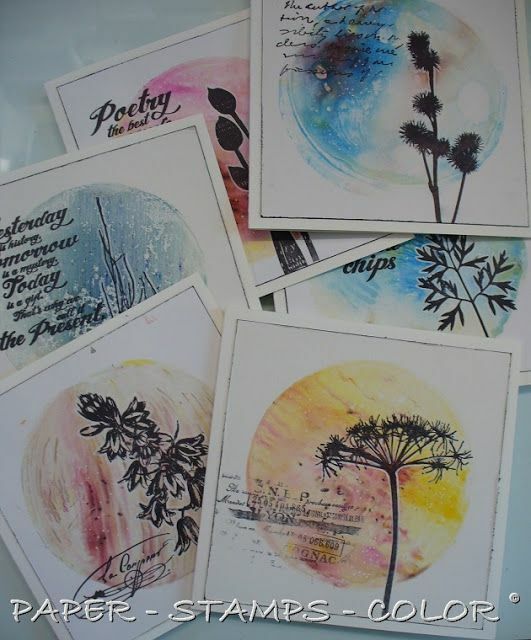 A project now from Carolyn Dube, not only showing gelli printing but taking an underused substrate ...an envelope... and turning it into art! Follow through to see how her mail art turned out. 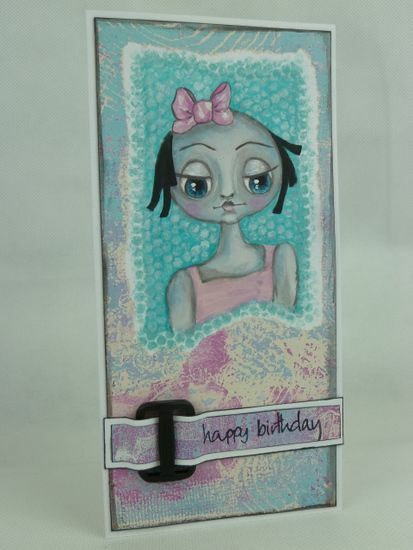 Another gelli print here, used in the background with a hand painted face over the top. I gelli printed onto smoothy card, using torn paper to mask off areas that could be kept clean ready for the focal image. 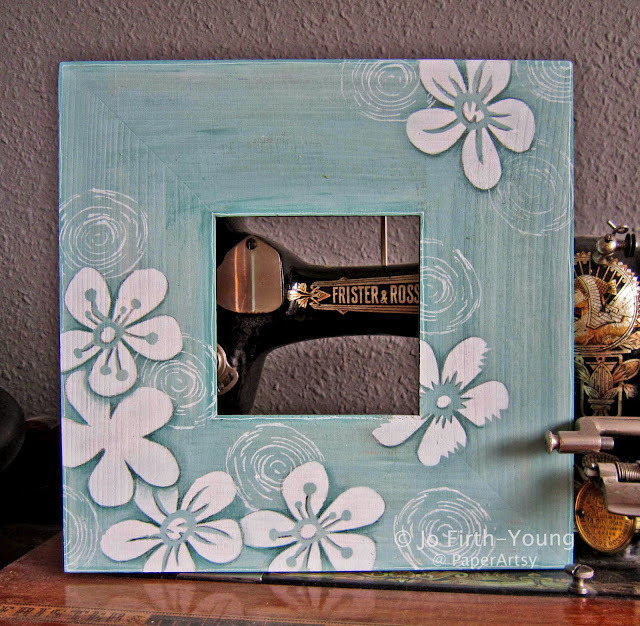 So easy to do and you end up with a ready made frame for your drawing or stamped image. You might think that Frescos are just craft paints, they are so much more, they are highly pigmented and can be used in free hand paintings too. 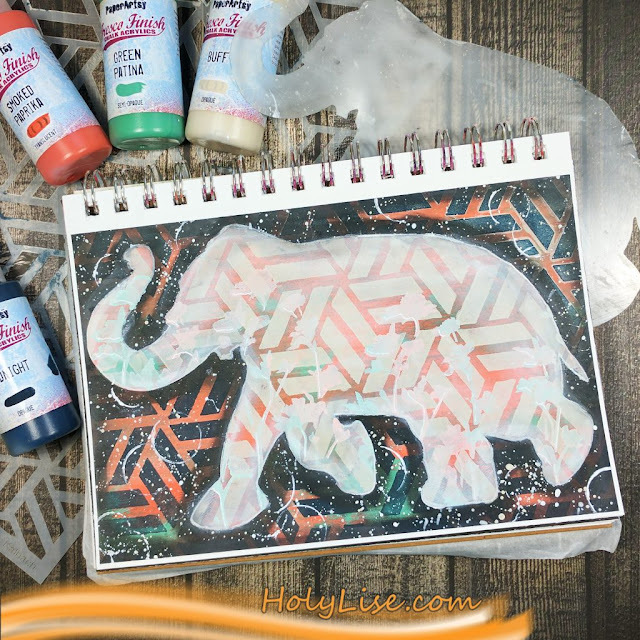 Here is a journal page, which started with stencilling in the background with very bold Frfesco colours, these , once knocked back made the perfect base for a graphite drawing. Fresco finish creates a beautiful matte base, very easy to add sketches over the top. 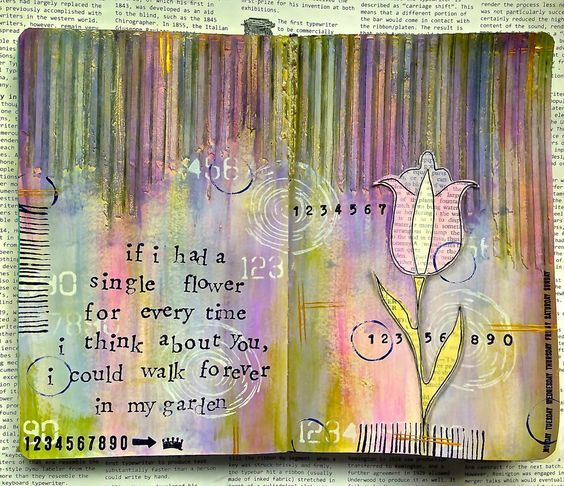 Pam Carriker is a great artist and teacher around the globe, she too has used PaperArtsy Frescos to do some freehand painting. A fun technique to finish with, using shaving foam! Follow through to see how Suzanne Czosek used this unlikely tool to create a delicately marbled background. So, if you are lucky enough to have purchased Seth's new colours, or if you have his old colours, or if you have any of the other Fresco colours, now it is over to you. Bring out those little bottles of goodness and get painty. Push yourself, try a new technique, maybe you have seen one you have been just waiting to try, now is your chance. We want to see your painty creations so don't forget to link up. 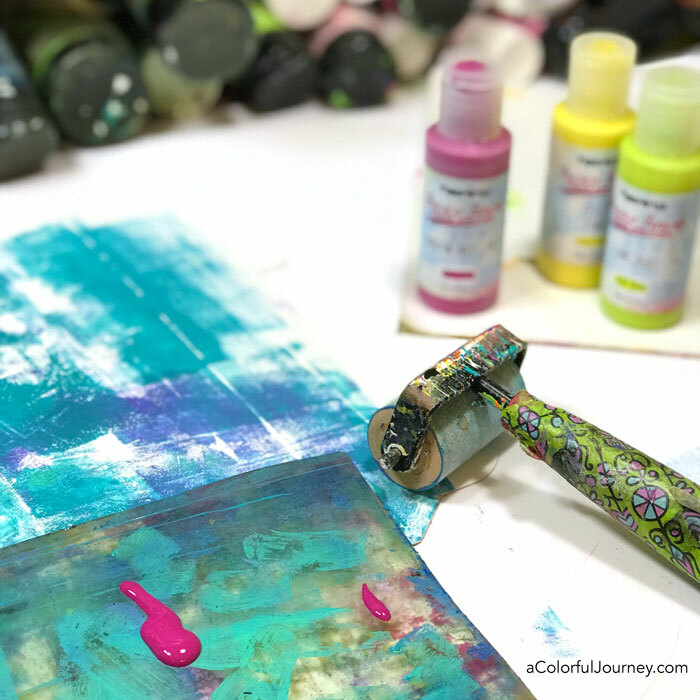 Don't forget to follow Darcy and Leandra's Pinterest boards, or the PaperArtsy Fresco Pinterest Page if this topic pushes your buttons, you will see plenty more examples to whet your appetite there! I am really looking forward to seeing what you create over the next 2 weeks! The current topic link Topic 2: Seth's Frescos will close 17:00 (London Time) Sunday, 18th February 2018, and the winner will be announced 2 hours later at 19:00.
ooh what a great subject! Ooh awesome..... I'm off to watch the videos! Great challenge topic, Seth's paint colours are gorgeous. Such a great theme and the samples are wonderful! Lots of wonderful inspiration with the... oh, so fabulous... fresco finish paints!!!! Gorgeous samples in the post..I always like to go through all the examples in the theme post for a new challenge. Great paints and really fabulous inspiration!!! I also love - seeing again sometimes - the videos introduced, really good. Happy end of week and Good Luck to everyone for the challenge (still missing time to play with you at the moment...). I love frescos and the inspiration provided. The bobbin book is sweet. Thank you for the blog and the marvelous creations that everyone makes. They really get me pumped to create. A perfect topic, Fresco paints are so good to work with. Loads of inspiring examples again this month and I really love the new Seth Apter colours. Thank you PA team for the apron! I love it. 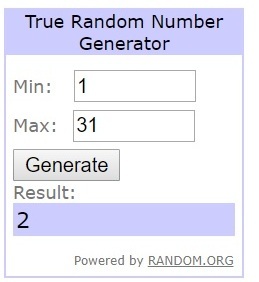 Good luck to everyone in the February draw. This is a great theme, the examples are a real inspiration. There is so much talent out there. I love the new Seth Apter paint colours. 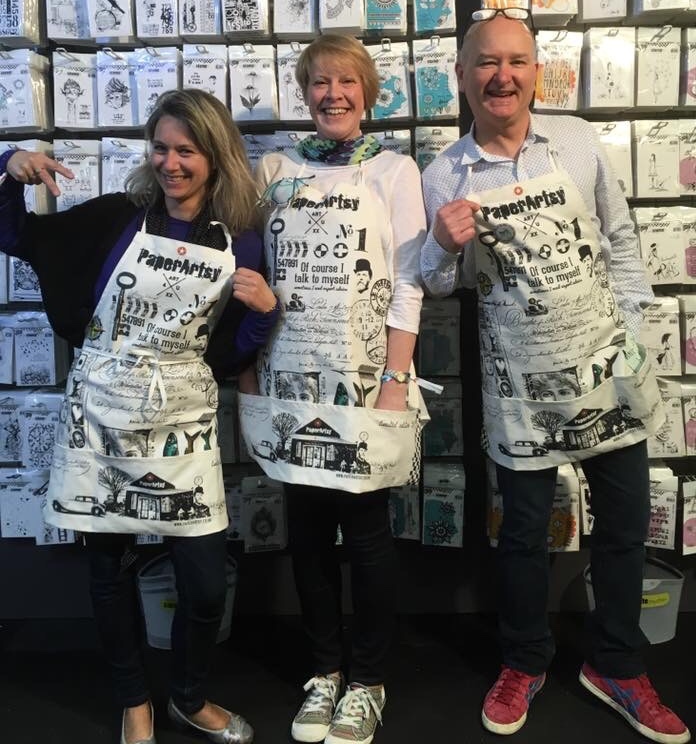 Thanks to the PA team for the apron, it is so lovely. Good Luck to everyone in the draw for February.